Karl is a solid Flame attacker, bringing Slayer Bonuses for IO and a teamwide Strength buff. 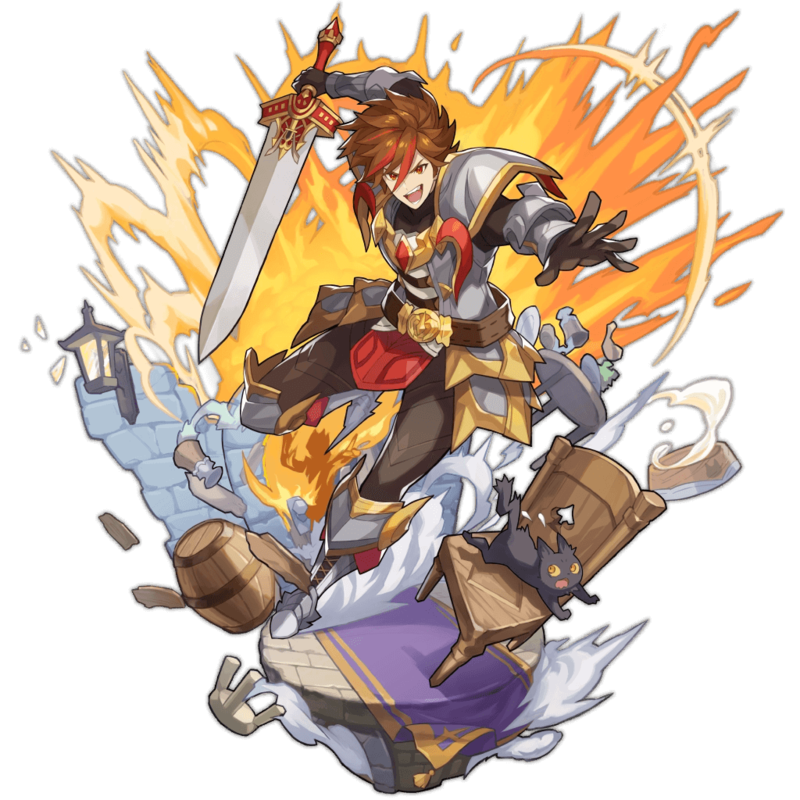 With Swords being such a nimble weapon type, and Dragon Haste a versatile Co-Ability, Karl fits nicely into almost any Flame team. Soul Ignition and a low-maintenance Strength Passive keep both team damage and Karl’s own DPS high. Like Ezelith, he lacks the Stun Res for High Midgardsormr. A passionate youth with sights set firmly on justice, he disposes of evil with extreme prejudice. While he strives to serve a higher good, he also dreams of the day when the name "Karlsplosion" echoes across the land. 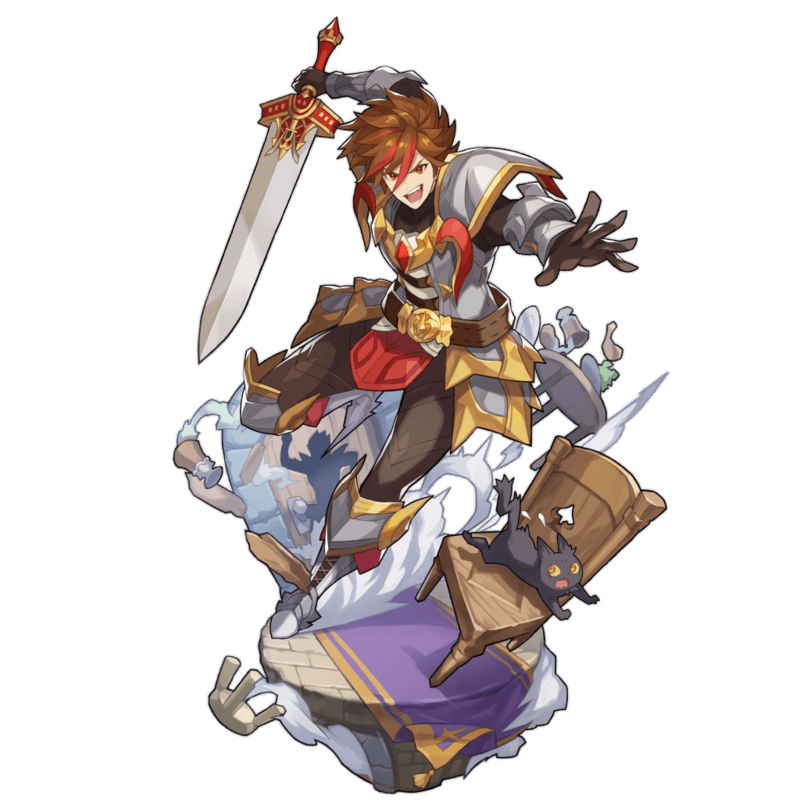 Karl is a 4★ Flame Sword adventurer from Dragalia’s original launch pool. Although the Hero of Justice was slightly overshadowed by the release of 5★ Naveed, he still thrives in Wind IO. In contrast to the numerous other Flame Swordsmen, his damage is more straightforward and his allies enjoy a teamwide STR buff. This attack-support hybrid approach works wonders for Emblem farming, especially when Sleep Res guarantees full attacking uptime. Slayer’s Strength and Sleep Immunity are perfect for such a high density environment. Karl breaks from the usual hyper-offensive nature of Sword wielders, granting his allies a powerful, lengthy STR buff. The quick SP gains from Sword swings also suit his supportive role. While Karl doesn’t have to ramp up as much over time, his power is conditional on staying healthy. This may prove difficult when facing chip damage from multiple enemies. Agni and Cerberus provide raw damage. Prometheus and High Brunhilda add survivability. Ifrit, Brunhilda, Pele are affordable power picks.